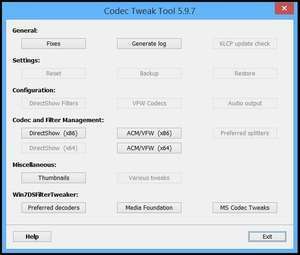 K-Lite Codec Tweak Tool is a small Windows utility which can help resolve codec issues. The program's premise is quite simple: To fix any errors and video playback issues created by the installation of one or multiple video codec packs. As the developer of several video tools and the K-Lite Codec Pack, the team over at Codec Tools knows a thing or two about codec conflicts. With K-Lite Codec Tweak, you can easily find all installations of codecs and filters. Version 6.3.9 is a freeware program which does not have restrictions and it's free so it doesn't cost anything. For security reasons, you should also check out the K-Lite Codec Tweak Tool download at LO4D.com which includes virus and malware tests. Additional screenshots of this application download may be available, too.